Rethinking Faith and Church: Divine Control: The Accident that Wasn't? Divine Control: The Accident that Wasn't? Do you ever chase a theme through the Bible just to see what else it says on a related subject? I do sometimes. This morning I was reading Proverbs 19 and came across the following verse that I had previously underlined. Taken together, I then started wondering if perhaps we don’t have a lot less influence upon our world and circumstances than we typically think. 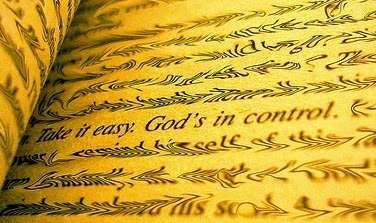 Is God ultimately in control, or is He not? Depending upon how one answers that question, raises a whole plethora of other potentially divisive questions. And then there is the amplification of the previous verse: “even events that seem accidental are really ordered by Him.” What are we to do with that? Are accidents then not really accidents at all? Most of us will no doubt struggle with that thought, yet it’s there. What do you make of it? Hmm. Anyways, there you have some of my Monday morning ramblings and musings. Have an awesome day. Peace & Blessings to you and yours. All Scripture taken from the Amplified Bible.